All month-long Columbus Museum of Art will be celebrating Day of the Dead. We asked Leticia Vazquez-Smith of Latino Arts for Humanity to tell us more about the holiday and how she celebrates. The celebration of Dia de los Muertos (Day of the Dead) is one of the most sacred and revered days in the Mexican and Central American cycle of feasts. It stems from the ancient pre-Columbian belief that as long as one was remembered by family and friends, one continued to live. In celebrating the dead, they were kept alive. Why is Day of the Dead important? It is very important to preserve the festivity that holds a great significant in the life of Mexico’s indigenous communities and that provides the opportunity to celebrate life and death as a duality allowing people to commemorate in a very special way the life of those who have departed. 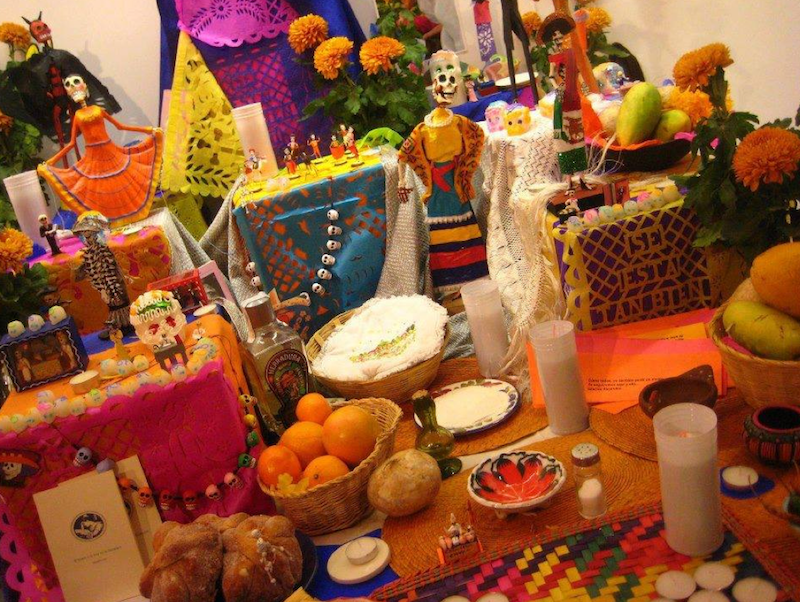 How do you celebrate El dia de los muertos? In my family we start the celebration days before by gathering Cempasuchitl flowers and arranging for the “ofrenda.” Preparing the portraits and deciding the menu to present to our friends and family. My mom and me will cook together and try the family recipes. will set the offering with incense, water, candles, salt, flowers, will spread the petals on the floor and set the “papel picado.” Once everything is in place, we will seat and eat. Then the next day the visit to the “panteon” Cemetery. Once in the cemetery everybody will start cleaning and sometimes re-painting the graves, then the flowers and decorations are set. While everybody is getting ready there is an opportunity to talk to the once have passed away. We start the “copal” incense and play music. Family and friends bring food and drinks. It is a great time to enjoy family and memories, some will cry some will laugh. Everybody will eat or drink. I love to visit the cemeteries that are far from the city in small villages with my friends and enjoy the big party with traditional food and music! For more on Columbus Museum of Art’s Day of the Dead programs visit the Events and Programs page. Leticia Vazquez-Smith a cultural worker, researcher, craftswoman, and an avid promoter of Mexican traditions and culture in Columbus. She is also president of the Latino Arts for Humanity. Two of her specialties are “foodways” and “Day of the Dead celebration.” Since 1999 Leticia has presented bilingual community workshops about Day of the Dead. In 2005 she established an annual Day of the Day Community Event in Columbus, which this year takes place on October 20 at Greenlawn Cemetery.